Paris, France - circa May, 2017: Facade of the Centre Georges Pompidou in Paris, France on May, 2017. The museum is the third most visited attraction in the city. 4k00:07Paris, France - circa May, 2017: Panorama of the Centre Pompidou. In the center it is located the Bibliotheque publique d'information, and Musee National d'Art Moderne. hd00:13PARIS, FRANCE – APRIL 8th: Exterior of the Georges Pompidou center in Paris on April 8th, 2012. The Pompidou center houses a vast public library and the largest modern art museum in Europe. hd00:11PARIS, FRANCE APRIL 8th: Exterior of the Georges Pompidou center in Paris on April 8th, 2012. The Pompidou center houses a vast public library and the largest modern art museum in Europe. 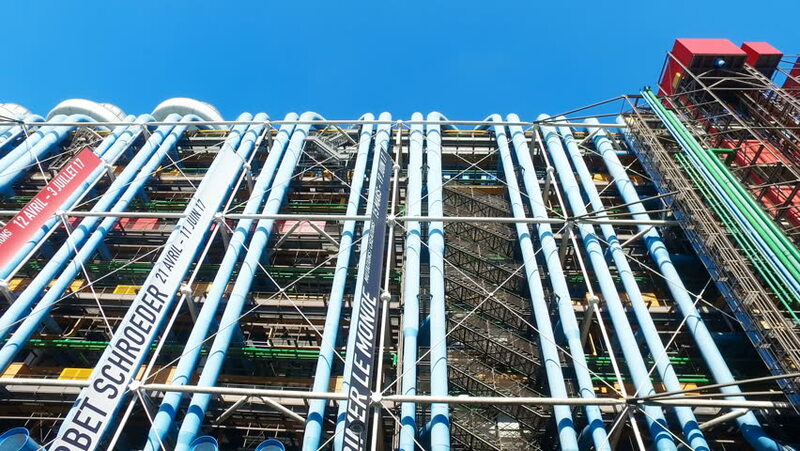 4k00:17The pipework for the internal services on the Rue du Renard side of the Centre Georges Pompidou (1977) , Paris, France street tilt down. hd00:15Yokohama - June 2016: Amusement park attractions with water ride drop and ferris wheel at Yokohama Cosmoworld. 4K resolution slow motion.